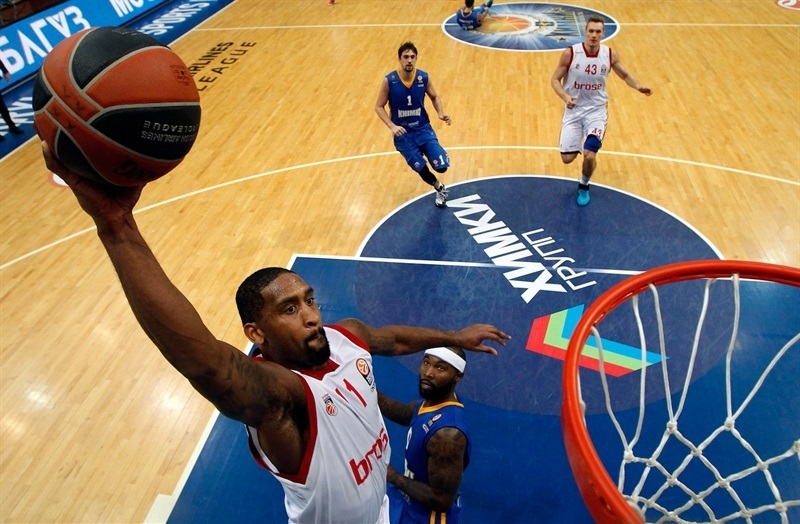 Khimki Moscow Region registered its third home win in Group F by downing Brose Baskets Bamberg 78-61 on Friday. 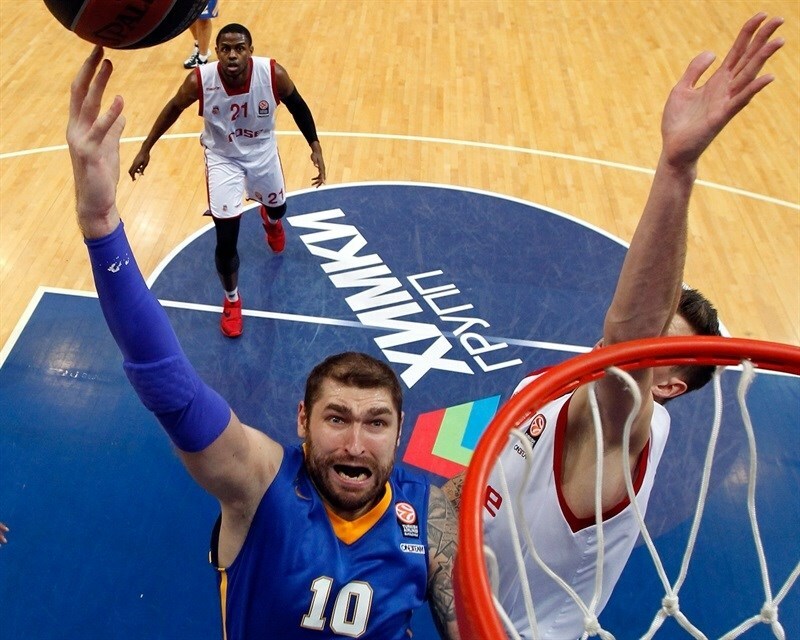 Khimki improved to 3-1 the group, while Bamberg dropped to 2-2. 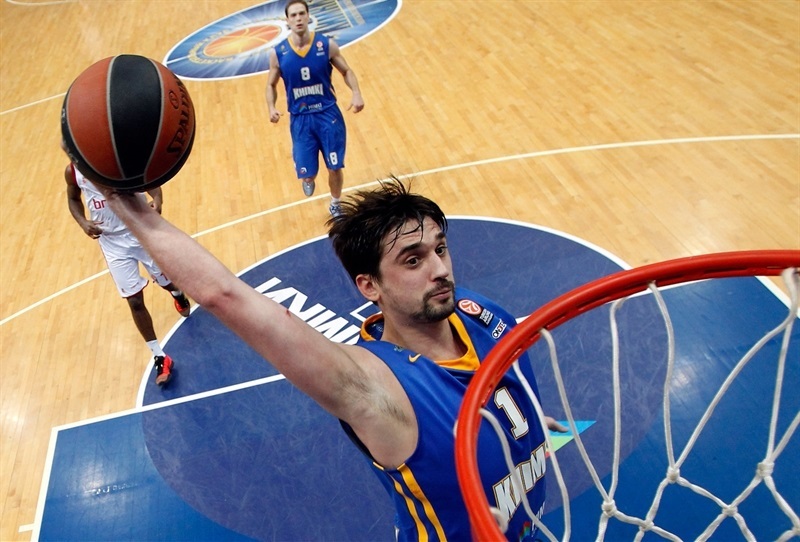 Alexey Shved led the winners with 22 points and backcourt mate Petteri Koponen added 11. 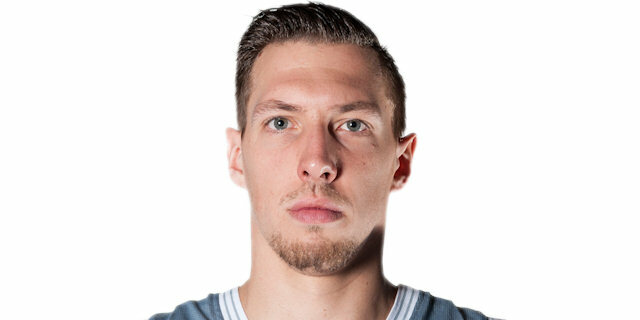 Janis Strelnieks led Bamberg with 13 points while Daniel Theis scored 12. Nicolo Melli shined early to give Bamberg a 4-8 lead. 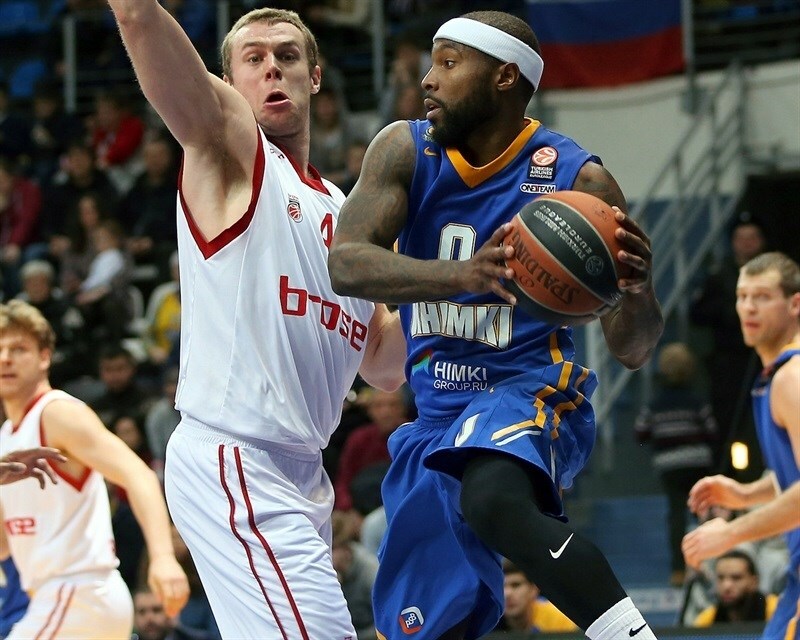 Zoran Dragic struck twice from downtown and got help from Tyrese Rice to put Khimki ahead 16-12 after 10 minutes. Shved took over early in the second quarter to make it an 11-point game. 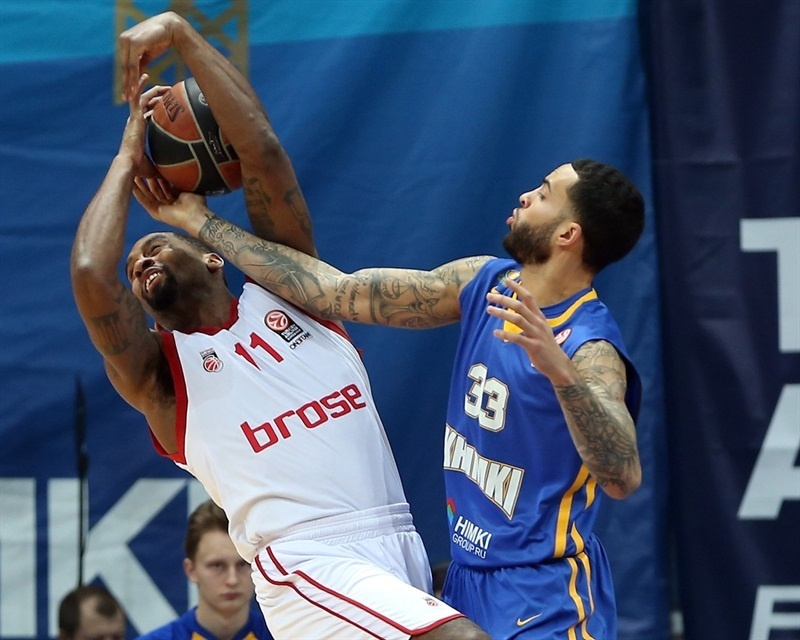 Bradley Wanamaker and Janis Strelnieks fueled a 0-12 run that gave Bamberg a 27-28 lead, but Shved and Dragic helped Khimki regain a 30-28 edge at halftime. A fast break dunk by Leon Radosevic gave Bamberg its last lead, 32-34. Tyler Honeycutt and Shved helped Khimki move in front 54-45 after 30 minutes. A fast break dunk by an unstoppable Shved made it a 20-point game, 68-48, and Bamberg never recovered. Melli got Bamberg going with a mid-range jumper, as Khimki missed 3 times from downtown and committed 2 turnovers in the opening three minutes. Rice rescued the hosts with a mid-range jumper, which Nikos Zisis erased with a fast break layup. Melli kept pacing the guests with a turnaround jumper, before Marko Todorovic and Zisis traded free throws. A three-pointer by Dragic brought Khimki within 1. Dragic insisted from downtown to give Khimki its first lead, 10-8. Rice buried a stop-and-pop jumper in the lane, but Melli countered with foul shots. Bradley Wanamaker scored around the basket to tie it at 12-12. Rice stayed hot with a fast break basket, which Dmitry Sokolov followed with a two-handed dunk for a 16-12 Khimki lead after 10 minutes. Sokolov split free throws early in the quarter and Shved scored in the low post to boost the hosts' lead to 19-12, after a 7-0 run. Wanamaker fed Theis for an alley-oop dunk, but Bamberg kept struggling to score and committed two 24-second turnovers in the first four minutes of the half. Koponen stepped up with a driving layup and a catch-and-shoot triple by Shved made it a double-digit game, 24-14. After a Bamberg timeout, Wanamaker tried to change things with free throws, but Shved did even better with a big triple. Lucca Staiger shined with an off-balance jumper and Melli added a three-pointer that prompted Khimki to stop the game at 27-21. Wanamaker scored around the basket and followed Strelnieks's triple with a fast break dunk that completed the visitors' comeback at 27-28, at which point Khimki called timeout. Shved split foul shots and a backdoor layup by Dragic fixed the halftime score at 30-28. Augustine scored down low soon after the break, but Radosevic followed a close jumper with a jump hook to tie the game again at 32-32. Radosevic kept pacing Bamberg with a fast break slam, forcing Khimki to stop the game at 32-34. Egor Vyaltsev made free throws that Wanamaker matched with an electric driving layup. 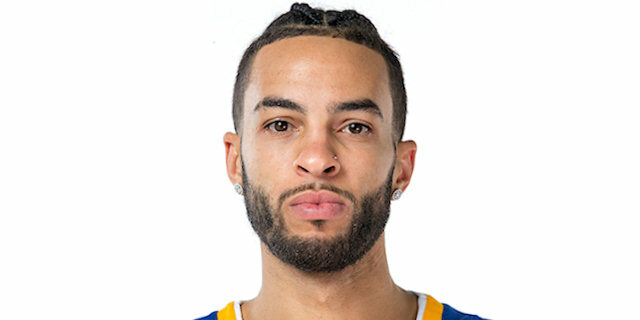 Tyler Honeycutt struck from downtown and Rice bettered Darius Miller's driving layup with his own shot from beyond the arc for a 40-38 Khimki lead. Zisis, Honeycutt and Sergey Monya each hit a couple of free throws and a layup by Sokolov set a 46-40 Khimki margin. Shved banked in a three-pointer off the dribble, as Bamberg committed turnovers. Honeycutt hit foul shots, but a three-pointer by Theis and a driving layup by Wanamaker brought Bamberg within 51-45. 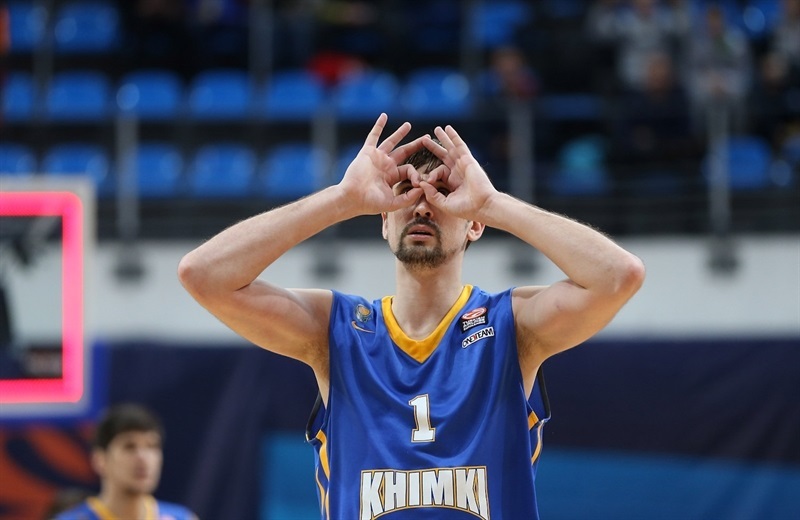 Shved banked in a buzzer-beating triple from way downtown to boost Khimki's lead to 54-45. Shved made free throws early in the fourth quarter and a layup by Sokolov made it a 13-point game. Bamberg struggled to score for more than two minutes and a layup by Todorovic gave the guests a 60-45 margin with seven minutes left. Petteri Koponen stepped up with a three-pointer to cap a 12-0 run that bridged between the last two quarters. Radosevic split free throws and Miller hit 2 attempts to, but Koponen hit another one from downtown and Shved took over with an outstanding fast break dunk that sealed the outcome at 68-48. Miller and Augustine exchanged baskets and a jumper by Theis brought Bamberg a bit closer, 70-52. Wanamaker split free throws before Shved swished a jumper and split free throws. Theis followed an alley-oop slam with a three-pointer for that made it 74-58. 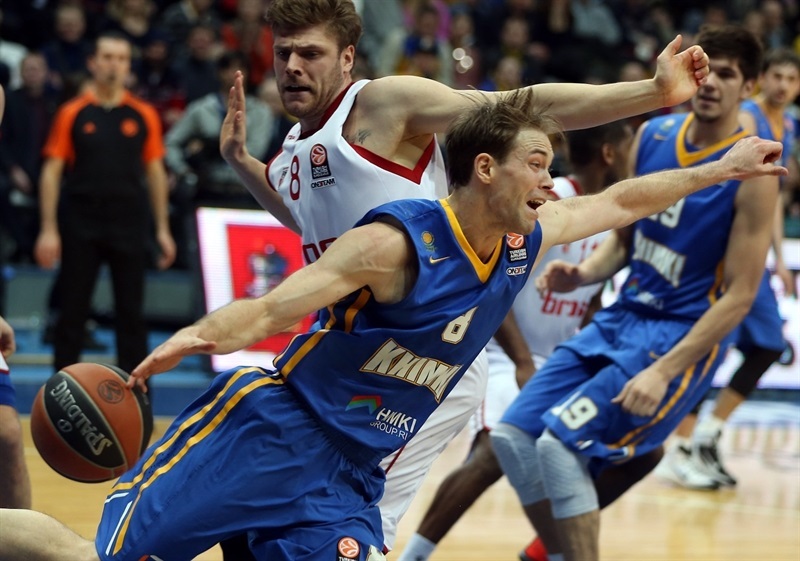 Staiger hit a triple in transition, but Khimki had cruised to an important win. “I’m really happy that we won against such a strong team like Brose Baskets because some opponents don’t respect them. We respect them very much. We saw how they have played all this season. They have a perfect team and a perfect coach in Trinchieri. I’m happy we did a really good job on defense. I want to thank all the team that gave the maximum effort and energy. Everyone did a big job tonight." 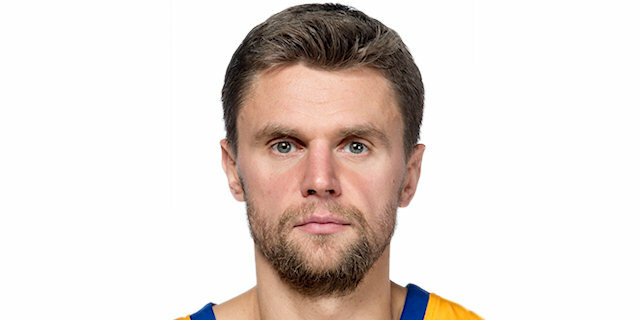 "Congratulations to Khimki. They deserved to win this game. We played without the right energy and didn’t match the physicality of Khimki. It was simply a blowout. Two three-point shots at the end of a shot clock by Shved and a big three from Rice killed us. But this could have happened and doesn’t change the fact that we played a bad game. The other thing is to learn very fast from what happened. 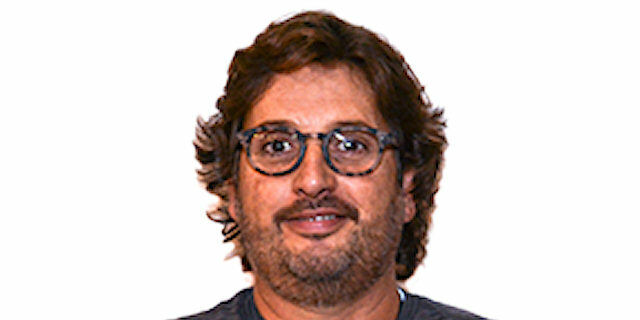 I believe you cannot skip these kinds of lessons because in this part of a Euroleague season, the point is that we should be solid all 40 minutes, not just for 20. We should keep the game under a 10-point difference. We were not smart and had a lack of energy. Moreover we were not physically enough." “We have a strong battle in our group as all the teams have at least one win. Now everything is just beginning. It’s important to win all home games and it doesn’t matter if we face Brose Baskets, Real Madrid or Barcelona. We prepared seriously for this game because Brose Baskets has a very well-organized team from a tactical standpoint. They have good coach and smart players; they play team basketball. I think we showed good team play, although we didn’t find our rhythm in the first half. Brose Baskets played aggressively in defense that made a lot of problems for us, and the score was so low. After halftime, we came out and made a run." "We played good defense that gave us easy baskets in the second half. We stopped turning the ball over and got stops. We know how many important games we have in the Top 16 and we want to win them to go to the playoffs." 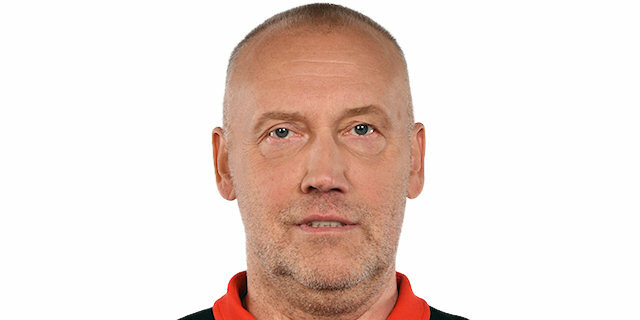 "We just didn’t play well in defense and in the offense; we didn’t move the ball and let Khimki score 78 points and that is too much for an away game. That’s the reason why we lost. Khimki played good defense that we didn’t expect. We were not ready for that. They showed very good defense to avoid the shots from our best shooters."